Would you make a good pipelayer? Take our career test to find out how you match with this and over 800 other careers. What is the workplace of a Pipelayer like? Pipelayers have played a large role in creating the infrastructure of modern civilization. Modern plumbing and much of the world's energy all depend on pipes that these workers have laid. Pipelayers are often confused with pipefitters, and while they are in the same class of work, they are not technically the same job. Pipelayers are the tradesmen who perform the initial groundwork for construction by laying down pipes that provide sewage disposal, drainage or water. Apart from construction, some of the other industries in which a pipelayer may work include natural gas distribution, where pipelines are used to carry the gas to be used as fuel, and the building of utility systems. One aspect of the pipelayer's job involves cutting lengths of pipe to form sewer systems, or the infrastructure for carrying natural gas or water. The pipe has to be cut very precisely to conform to specifications and aligned perfectly before being connected by welding, or with the use of cement or glue. They may also be responsible for digging trenches for the pipes they install. The trenches must also be dug to requirements that are often very specific and thus require skill and knowledge to excavate. Pipelayers must use multiple skills in their work, from heavy equipment operation in some cases, to blueprint reading. For example, pipelaying will often involve a lot of welding as it is one of the main ways of connecting pipes; many pipelayers are also skilled welders. It should be pointed out that the welding methods used in connecting pipelines are different from other types of welding. Pipelayers may be required to weld manually, or to use automatic welding equipment, depending on the job. The goal of the pipelayer is to make sure that the pipes are laid correctly and welded properly the first time so that they will be reliable and not need repair for a long time. In the event that pipes need to be repaired, this may also be a part of a pipelayer's job description. 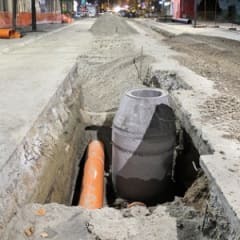 They may be required to inspect and perform maintenance on already-installed pipelines and also to tap existing pipelines to connect devices or new, secondary pipelines. Are you suited to be a pipelayer? Pipelayers have distinct personalities. They tend to be realistic individuals, which means they’re independent, stable, persistent, genuine, practical, and thrifty. They like tasks that are tactile, physical, athletic, or mechanical. Some of them are also enterprising, meaning they’re adventurous, ambitious, assertive, extroverted, energetic, enthusiastic, confident, and optimistic. Does this sound like you? Take our free career test to find out if becoming a pipelayer is right for you. Pipelayers work outdoors in conditions that may be harsh depending on where the work is being done. Pipelayers must have the ability to stand up against whatever the elements can throw at them, and they must be able to tolerate working in less than clean surroundings. The worksite where pipelaying is done is not only messy, it is typically noisy as well, due to the equipment being used and workers shouting to be heard over the noise of the equipment. Adding to the other pressures of the pipelaying work environment is the fact that the job is often hazardous, with workers in danger of being burned with welding torches or suffering any of the other injuries that may occur due to working around heavy equipment. They will be required to wear safety gear such as hardhats and work boots as well as safety vests for high visibility to equipment operators. If their role involves welding, they will also need the protective gear specific to that job as well.